If your dog got in a fight with a cactus and lost, here are some tools and tips to tackle removing needles. Different types of needle-bearing cacti grow all over the world, and certain areas of North America contain high concentrations of the plant. Unfortunately, our pets can get the spines (needles) of cacti stuck in their eyes, mouth, feet, ears and many other places. The sight of a needle-covered dog will most likely have you running for the tweezers, but sometimes you should leave the spines for the professionals to deal with. Please seek professional veterinary help if your pet becomes distressed. It might be better to sedate the pet, rather than have them suffer in distress. A stuck cactus spine should be treated as a puncture wound. The spines enter the skin and create an opening for bacteria. Before you start the removal process (if doing it yourself), have some antibiotic ointment on hand along with your removal tool of choice. Some use tweezers while others who have hunting dogs prefer hemostats (affiliate link). Start with a coarse comb to remove loose spines, but watch out — blood may spurt out of an entry point, so keep a styptic stick and gauze at the ready. Your pet may try to remove the spines with her mouth or by kicking her legs. Be careful — the spines can become dislodged and stick into your skin. Try to keep your pet calm and steady. Get someone to help you — it may make it infinitely easier to remove the needles. Your pet may also salivate or foam at the mouth if spines have penetrated that area. Use the comb to remove any loose spines from the dog’s coat. Remove individual spines that remain with tweezers or forceps by pulling in the direction of the fur growth. For spines stuck at a sharp angle against the direction of the fur, remove these as gently as possible in the direction at which they’re stuck. As you remove the spines, clean off any blood and stop bleeding at the entry points. If the dog has spines in different areas of the body, apply antibiotic ointment in one section before moving on to another area. It may be hard to pull out the spines or keep your pet steady or calm. Depending on where a spine is stuck, loosening or removing the spine may cause excessive or continuous bleeding. Prepare to visit your veterinarian’s office or local animal emergency room for further care and removal. If your dog was unfortunate enough to get a cactus spine in her eye, it’s best to leave removal to the professionals. Not all eye punctures require surgery, but visible spines and even micro spines may be present in the eye and require extreme care upon removal. Some spines may not need to be removed, but this should be determined by your veterinarian. Cactus spines are usually removed from dogs under general anesthesia; reconstructive surgery or grafts may also be necessary. After removal and/or treatment, check the entry points for infection and apply antibiotic ointment as needed. If the area becomes swollen, discharges or does not improve, make an appointment to see your vet immediately. 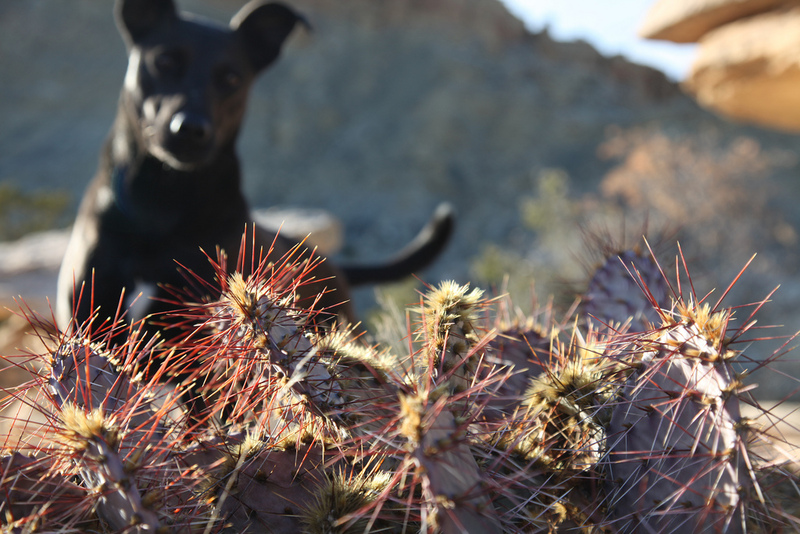 Let’s hope your dog will learn to avoid cacti in the future — and keep you from being on pins and needles.